The layered appearance of this glacially deposited boulder, grooves etched deeply into the rock by water erosion, reveals planes of weakness induced by tectonic compression. A negative example: This landscape includes multiple bedrock outcrops that have been smoothed and rounded by glacial-period ice. The ice flowed from right to left in the scene as pictured, rounding the landforms on the up-ice side and leaving cliffs of broken rock from plucking on the down-ice side. The hills shown are volcanic. Some are basalt or andesite, while others are felsic tuffs or flows. The common feature of the rock shown is the lack of planes of weakness that could be exploited by glacial erosion. These hills are in a region that was strongly affected by tectonic compression and tectonic cleavage would generally be expected. The absence of cleavage is a likely consequence of the composition of the rock. In particular, the rock may lack phyllosilicate minerals that would be subject to crystal grain alignment by directed compressional stress. Mixed examples: Each of the samples above show cleavage or jointing in only part of the rock. The top left sample (27 cm longest dimension) shows mudtstone with a bed of quartz pebble conglomerate running through it. Cleavage is distinct in the phyllosilicate-rich mudstone, but non-existent in the quartz conglomerate. 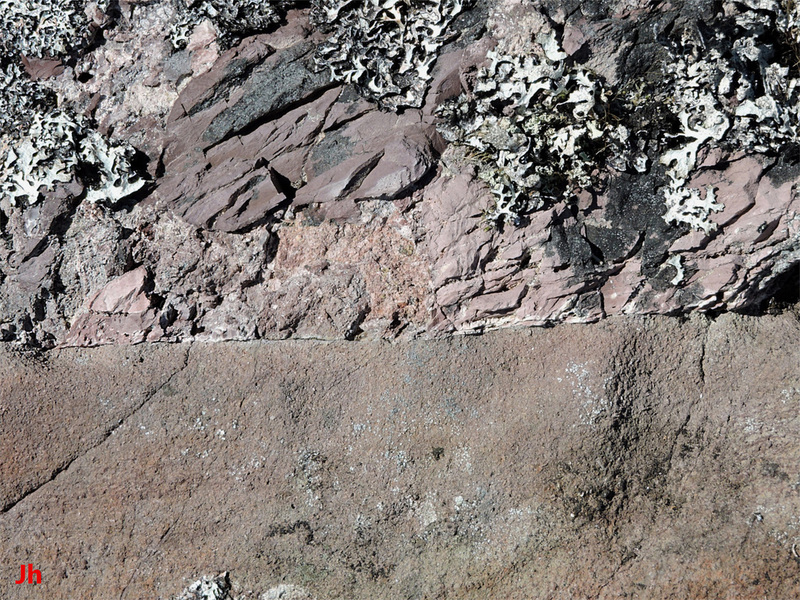 The top right sample shows a joint pattern in phyllosilicate-containing sedimentary rock, ending where the rock contacts pyroclastic volcanic rock. In the bottom left sample, siltstone rich in clay (likely illite, a phyllosilicate mineral) illustrates abundant tectonic cleavage while sandwiched between sandstone layers (predominantly quartz) that are less susceptible to cleavage development. 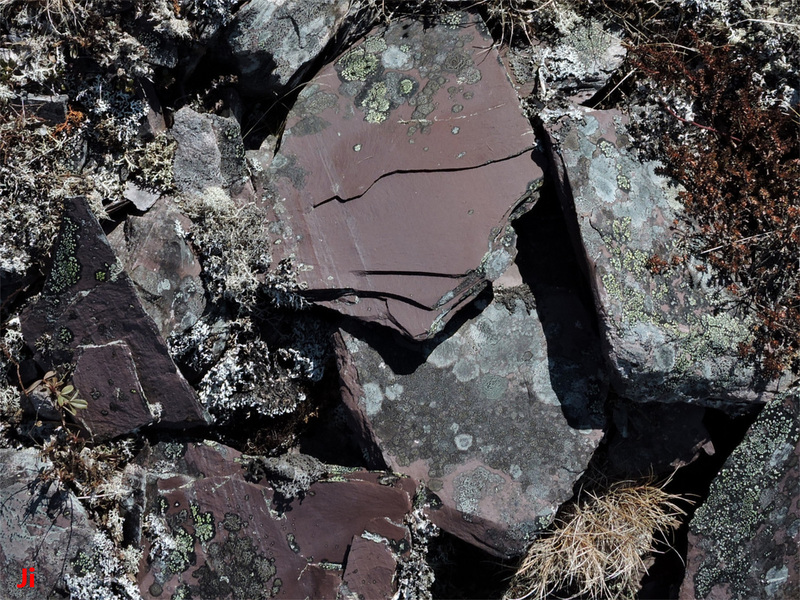 In the bottom right sample, slaty cleavage (of tectonic origin) in red siltstone ends abruptly at a contact with what appears to be medium-grained volcanic rock, possibly andesite. 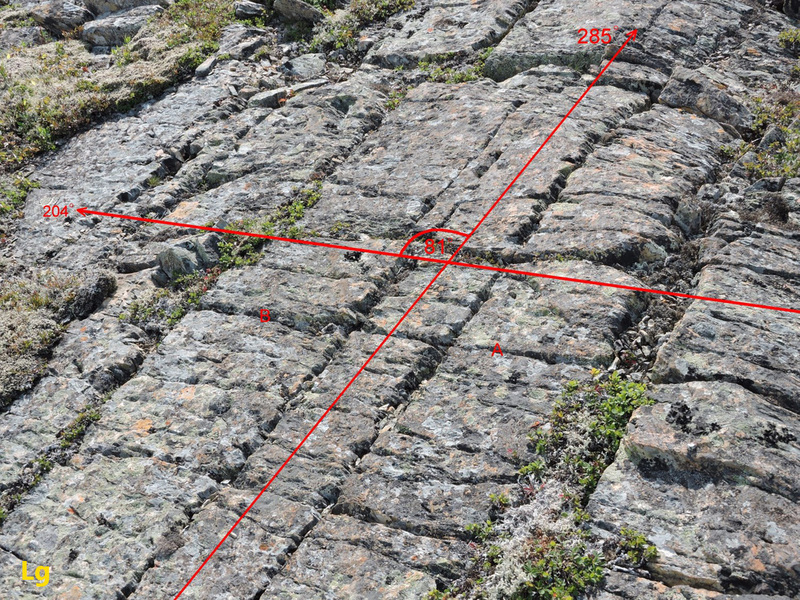 In each of the above samples, the cleavage and consequent jointing originated in tectonic compression that extended throughout all the rock, all parts of which are older than the Acadian orogeny (major tectonic event causing the cleavage). These examples demonstrate that both directed compressional stress and appropriate mineral content are necessary to produce the observed planes of weakness. Regional metamorphism guide: This map shows the Heart of Avalonia region divided into five 20 km wide zones according to distance from the trace of the Dover-Hermitage Bay fault (heavy black line). A sixth zone representing rocks more than 100 km from the fault is also shown. The map is intended as a very rough guide to regional metamorphism based on the assumption that metamorphic grade would tend to rise toward the D-H fault and that rock cleavage from directed tectonic stress would tend to strike along the contour lines shown. 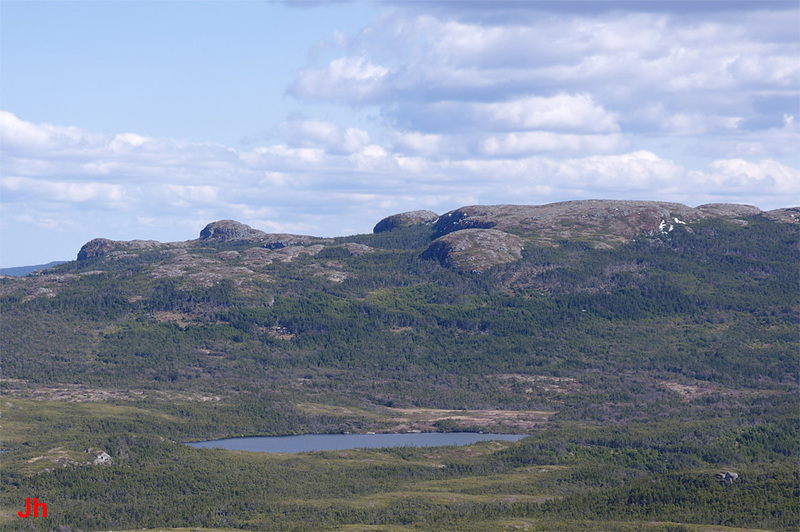 The Ackley granite is a large pluton emplaced after the Acadian orogeny, hence not affected by Acadian tectonic stress. Sedimentary rocks with high clay content are prime candidates for developing cleavage in response to directed compressional stress. 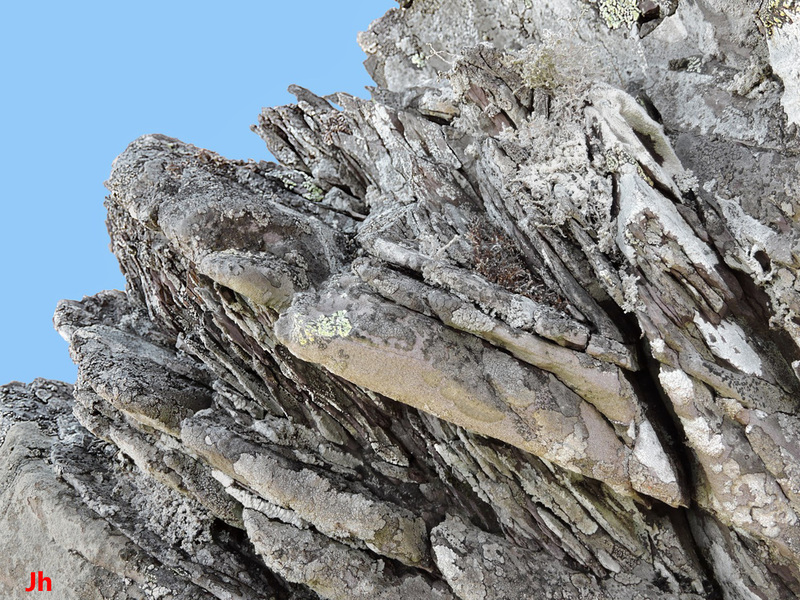 The resulting cleavage often causes the rock to separate easily on parallel planes that give rise to remarkably flat, thin and uniform sheets. 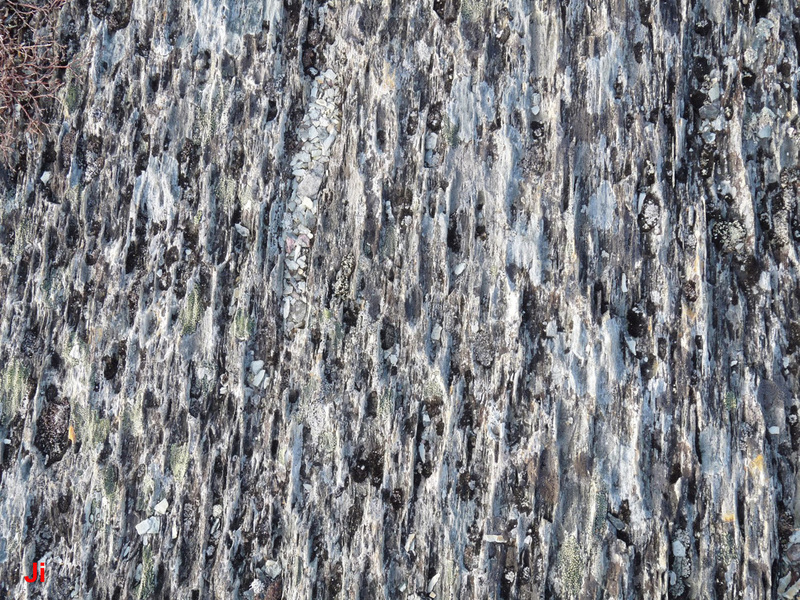 This is the cleavage typical of slate and is called slaty cleavage. 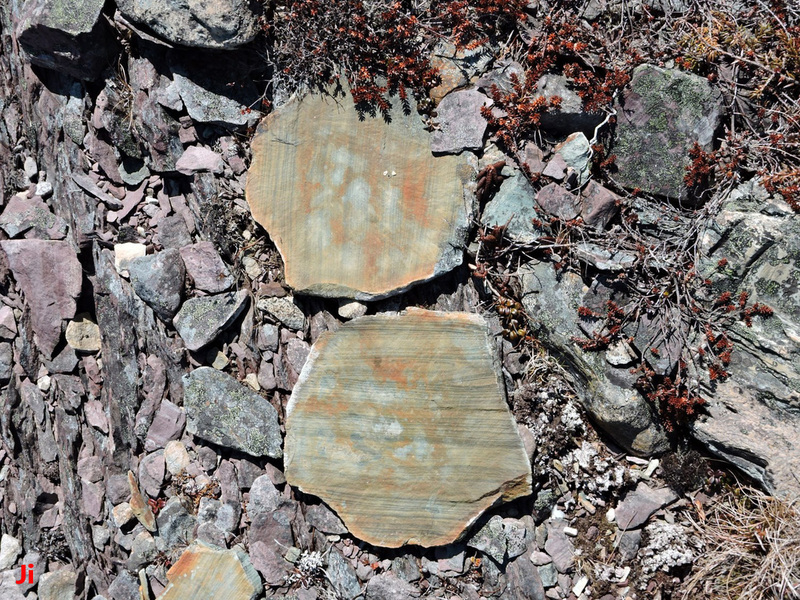 Slaty cleavage is common in low-grade regionally metamorphosed rocks and is found over many areas of Heart of Avalonia. The photo on the left shows slaty cleavage in red siltstone while the right hand photo shows similar cleavage in a coarser-grained fluvial sedimentary rock with clearly visible bedding planes. The specimens in both photos are about 15 cm across. When sedimentary rocks are formed, it is common for planes of weakness to develop parallel to the bedding. Such weaknesses may result from successive layers not bonding strongly together, or, the process of settling may cause phyllosilicate grains to preferentially settle flat, parallel to the bedding. 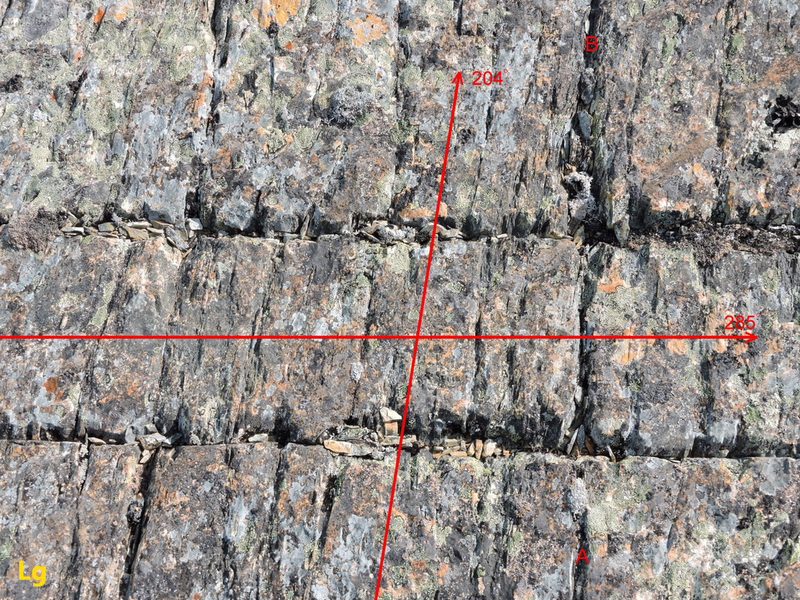 As thick depositions of sediment accumulate over geological time, pressure from the weight of overlying beds may cause further horizontal alignment of phyllosilicate grains. 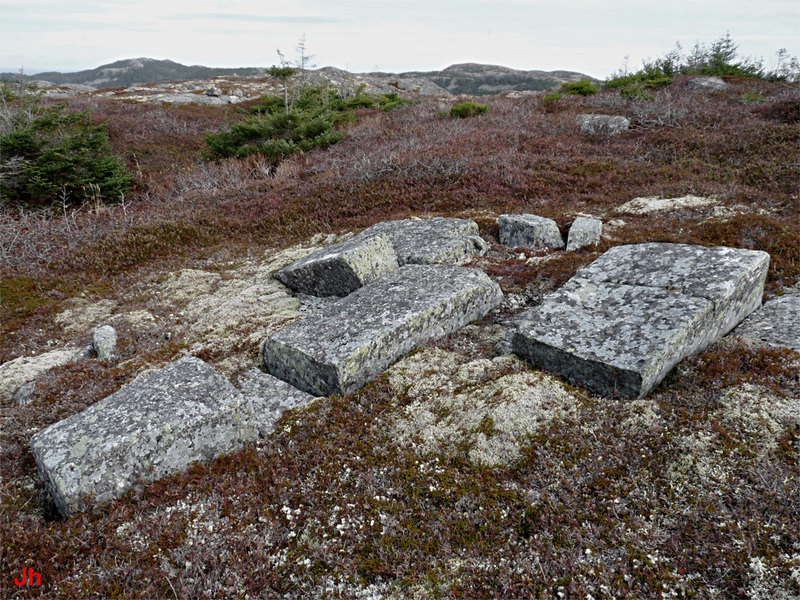 Both of the samples shown above possess cleavage perpendicular to the bedding. 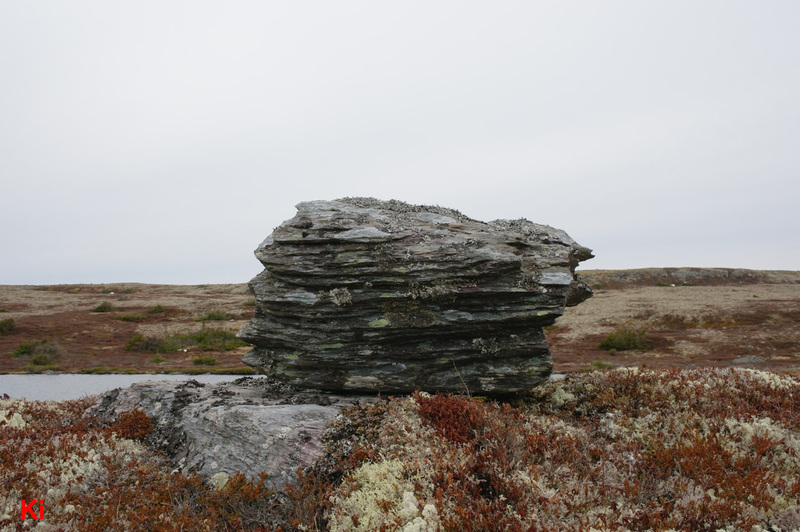 In a regionally metamorphosed environment, it is common for sedimentary beds, originally lying flat, to experience directed stress edge-on to the bedding, realigning phyllosilicate crystal grains by 90 degrees. The relationship between bedding planes and tectonic cleavage becomes more complicated when the rock is folded, and tectonic cleavage sometimes appears at shallow angles to the bedding, creating confusion as to whether the observed planes of weakness are tectonic in origin or are remnants of the original deposition of the sediments. When rock which cleaves readily shows obvious striping on the exposed flat surfaces, the cleavage is clearly tectonic. Each of the photos above shows a bedrock surface with longitudinal tectonic cleavage. 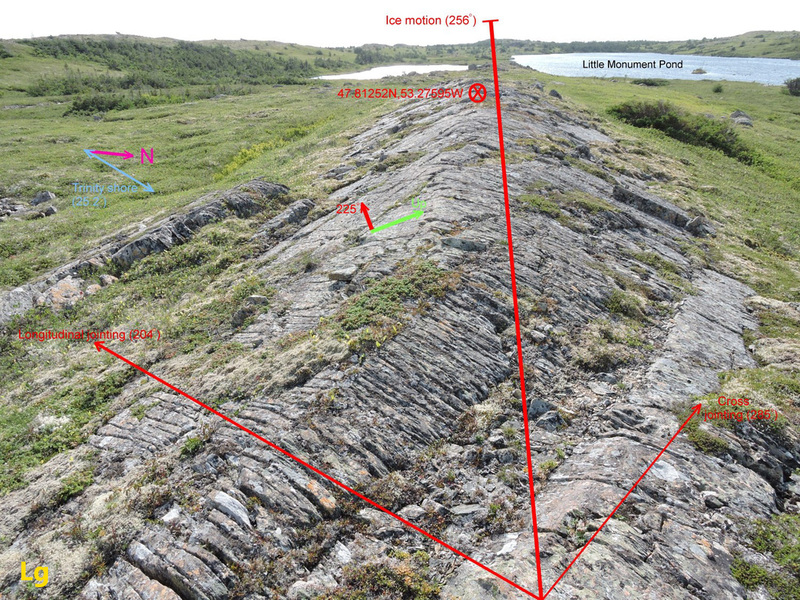 In the first picture (looking straight down on horizontal bedrock ~50 cm wide), no joints are visible. Rather, erosion by falling rain (probably aided by frost) has etched the surface, revealing the cleavage. 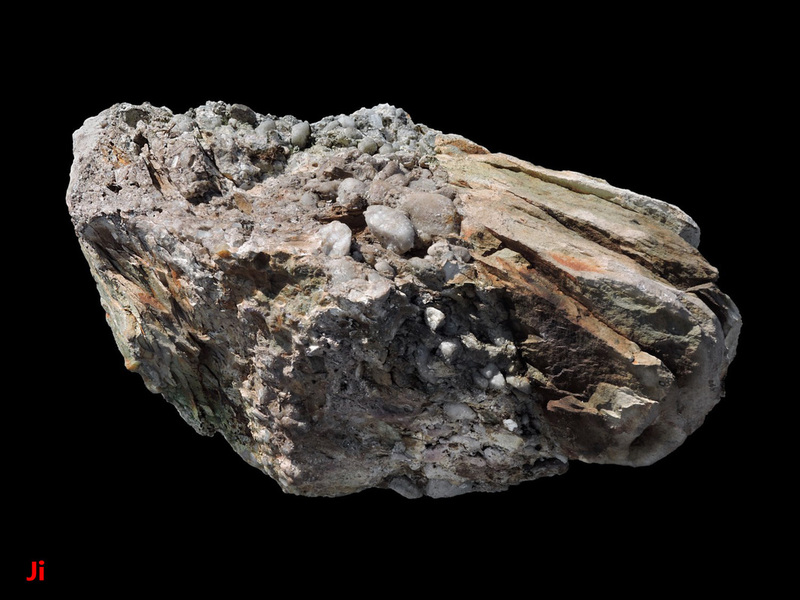 If a sample of this rock were to be cut out, it would readily separate into thin, flaky sheets. This type of surface appearance is common in many areas of Heart of Avalonia and appears in both clay-rich sedimentary rock and in volcanic rock. In cases where volcanic rock demonstrates this kind of cleavage, the rock would be expected to incorporate ample phyllosilicate minerals. Phyllosilicates are not normally found in freshly erupted lava or tuff, indicating hydration of the rock occurred in a subsequent metamorphic process. Hydration of common volcanic minerals yields phyllosilicates like mica, chlorite or serpentine, and, since a chemical change is involved, represents a process of metasomatism rather than just metamorphism. The right-hand picture shows a parallel repeating joint pattern as well as an etched surface indicating cleavage. The joints could be the result of water penetration into the rock and then, frost wedging. These pictures reveal horizontal bedrock surfaces with underlying longitudinal cleavage as evidenced by the etched surface. 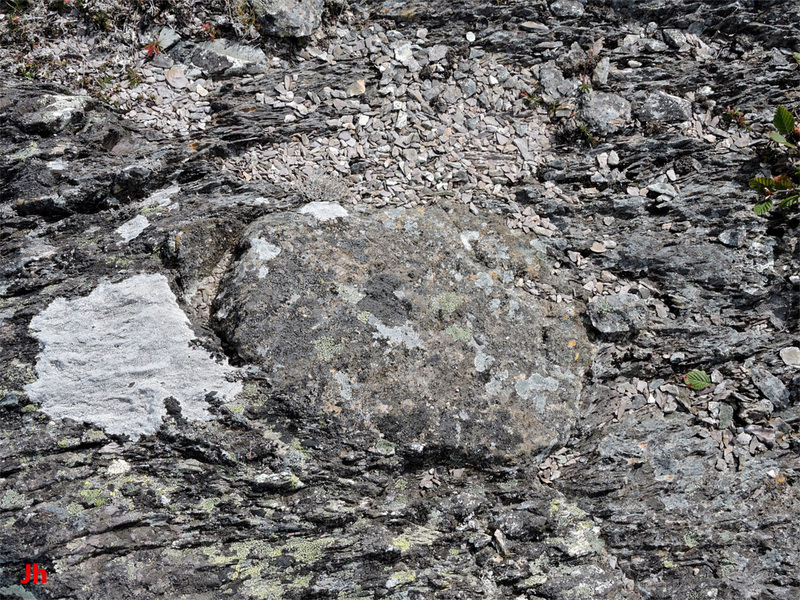 The first picture shows metasomatized felsic volcanic rock with a roughly circular (approx. 30 cm diameter) plug of basalt appearing at the center of the photo. The basalt did not develop tectonic cleavage as did the adjacent rock. Similarly, in the second picture, a small dyke of felsic igneous rock (center of photo, about 2 m long) stands out from the adjacent siltstone because of its lack of cleavage. 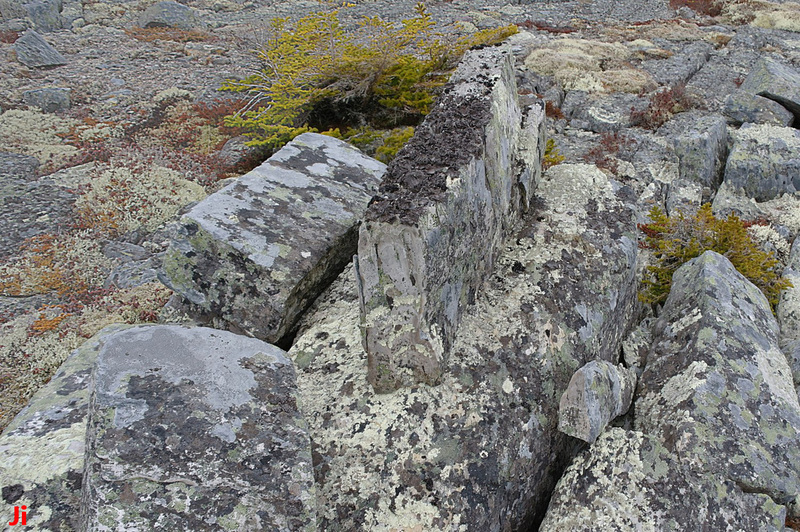 In both these pictures, the rocks are largely concealed by lichen, which, in the very wet climate of Heart of Avalonia, covers all exposed rock that is not freshly (within the last 2 or 3 decades) broken or eroded or exposed to waves or running water. While lichen can be quite diverse and colorful, it is more often dull grey, green or cyan, hiding bedrock color and texture and usually giving exposures, when viewed from a distance, a monotonic grey appearance. 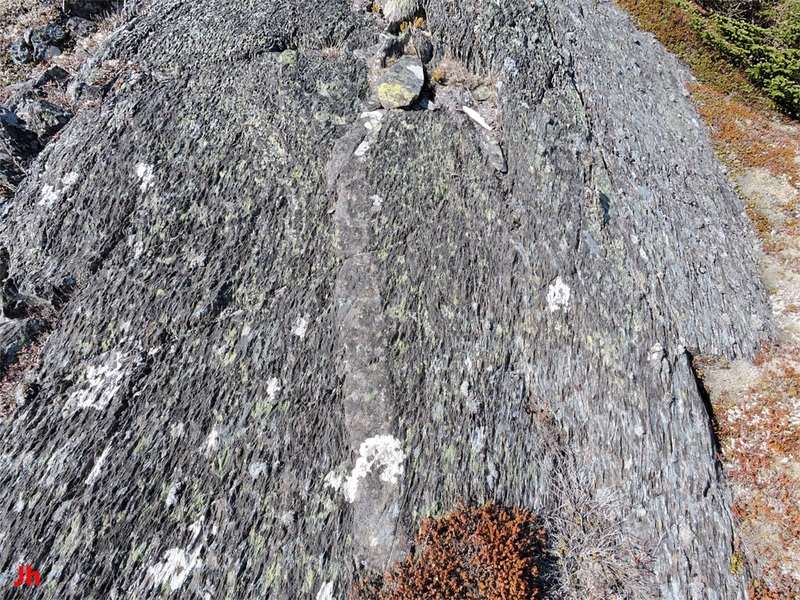 Most rock cleavage and related closely-spaced parallel joint patterns in the bedrock of Heart of Avalonia are of tectonic origin, are longitudinal, steeply dipping and strike in a north-easterly (south-westerly) direction. There are many exceptions, however, making it useful to estimate the strike (and sometimes the dip) of observed planes of weakness and related bedrock planar surface features to help classify them as originating from simple tectonic compression or another cause. This glacially carved horizontal bedrock exposure (both photos show same rock) demonstrates longitudinal and cross tectonic cleavage (jointing) in alluvial sedimentary rock. The first view is oblique, the second, looking straight down. The strike directions indicated (204 deg. for the longitudinal joints, 285 deg. for the cross joints) refer to a 360 degree compass with 0 deg. geographic N, 90 deg. geographic E. The contours on the regional metamorphism map shown above track 210 deg. (SW, equivalently 30 deg. NW) at the location where these photos were taken (approx. border zones 5-6). These joints appear to dip almost vertically. This ridge, eroded and streamlined by ice flow, shows strong longitudinal cleavage with consequent jointing (strike 204 deg. ), along with lesser cross jointing (mainly visible upper left). The approximate direction of ice flow is indicated as is the geographic location of the feature. A planar surface striking differently from the cross jointing (strike 225 deg.) is also present, clearly visible in the right foreground. A parallel surface is marked (yellow-green arrow "up" and red arrow "225") just left and above the center of the photo. 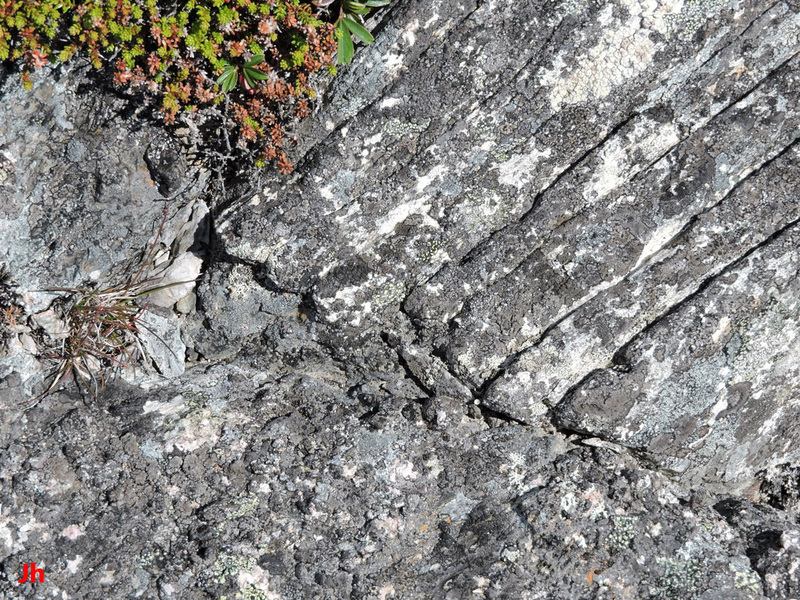 This surface may represent a plane of weakness from pre-Acadian tectonic activity (see section Planes of Weakness: Irregular). A magnetic compass can be used to determine strike, but digital compasses in cellphones or tablet computers are non-ideal, even after calibration, because varying electric currents in these devices can cause unpredictable deviation. Removable batteries are also a problem because batteries have ferromagnetic (iron) cases. A non-digital compass with knowledge of declination is functional when held away from magnetite-bearing rocks and iron objects. Course made good on a GPS unit (sight an object along strike and walk straight to it) is a reliable indicator of strike direction as shown in the photo. The strike can be recorded in a photograph of the track walked (or use waypoints) and then can be measured accurately in a photo editing program. 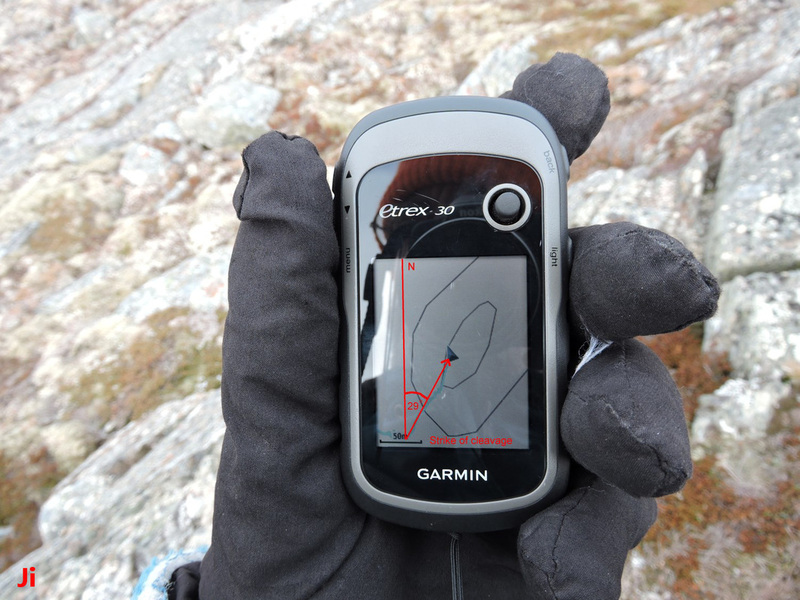 The GPS unit should be held perpendicular to the camera when photographed. GPS mapping software can also be used to get the direction without photography. Tectonic shear stress resulting from folding of rocks or from shearing associated with large-scale fault movement can produce planes of weakness either by alignment of phyllosilicate grains or by introducing failure planes (faults) into the rock. The most dramatic example of large-scale fault movement in Heart of Avalonia is the strike-slip action on the Dover-Hermitage Bay fault system. In some places this fault motion was ductile and in some places brittle. Most of the sheared rocks and associated landforms lie within 1 km of the fault. Shear-induced weaknesses associated with folding are much more common and can be found in any part of Heart of Avalonia. 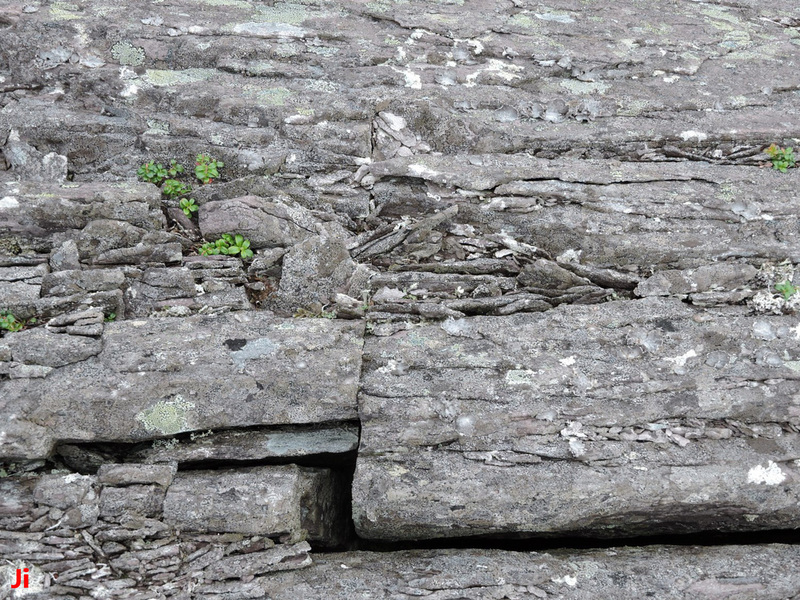 Bedding planes in sedimentary rock are the most common planes of weakness in areas that have not undergone significant regional metamorphism. 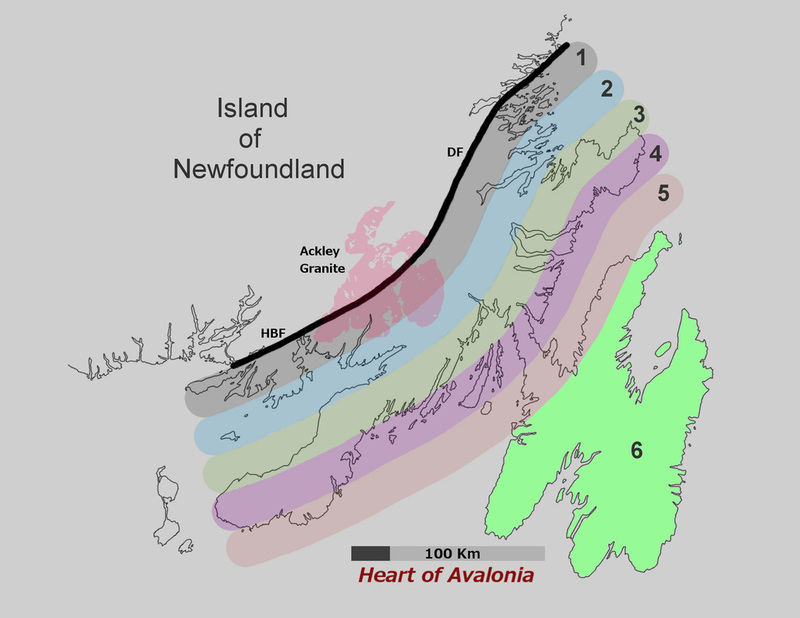 There are many parts of Heart of Avalonia, particularly in zone 6 as marked on the above regional metamorphism guide map, where sedimentary rock fails primarily on bedding planes. Occurrences of recognizable Ediacaran fossils are dependent on bedding-plane weaknesses and subsequent erosion of the rock along bedding planes. In some places, regional metamorphism has overprinted bedding-plane weaknesses, but not entirely, leaving rock that erodes along both bedding planes and tectonic planes. Volcanic rock in a few select areas of Heart of Avalonia has undergone rheomorphic flow, where pyroclastic deposits (ignimbrite) were plasticly deformed under their own weight while still hot. Rheomorphic flow generates shear stress and accompanying planes of weakness parallel to the ground. Planes of weakness in such eutaxitic (layered) ignimbrite are often overprinted by subsequent regional metamorphism. 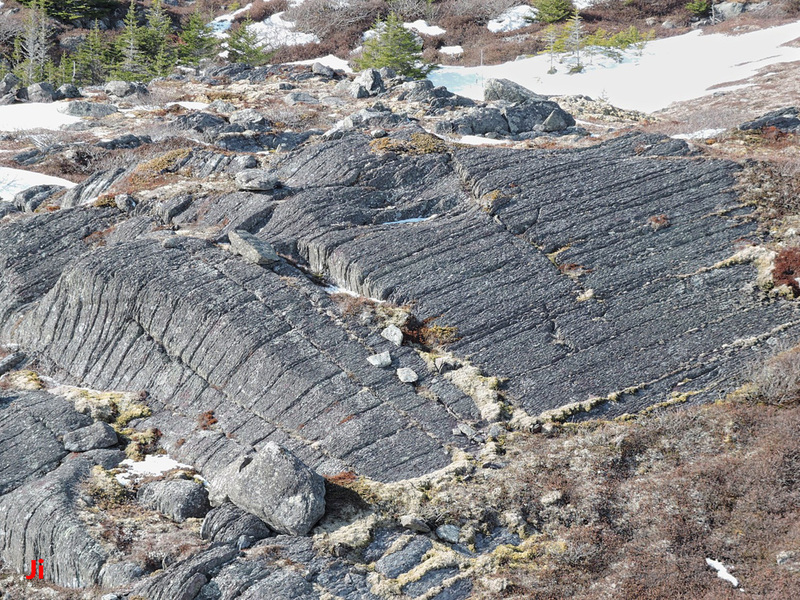 When a large mass of igneous rock (either volcanic rock or plutonic rock) cools, thermal contraction can cause the rock to develop joints in a regular cross-sectional pattern, often rectangular or hexagonal. This type of jointing can shape landforms in igneous areas, but in most of Heart of Avalonia, such jointing is difficult to recognize when overprinted with tectonic jointing. Compressional planes of weakness and each of the above-mentioned less dominant planes of weakness are illustrated and discussed here in their own respective sections. There is also a section dedicated to a specific landform, Serrated Hill, which exemplifies many of the influences of planes of weakness on geomorphology.